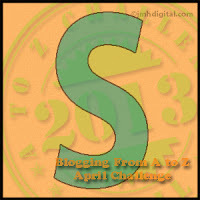 I joined the group "Blogging from A to Z" . You can still visit the site to read more stories by other authors. This is a a month long challenge to write a short story everyday and each day corresponding to the letter of the alphabet. I have linked up the site - simply click on the name so that you might read any sort of short story from the huge line-up available. The stories are supposed to be short so that many can be read, quickly. Simply a titillation of talent. Happy reading, and thank you for joining me. Mom and I ate quietly off to the side of the others. We found a nice large, soft, green tuft of grass and quietly munched. If we were too loud, that bossy Lydia would come over and push us out of the way. Lydia was older and much larger than either Mom or I and a lot more aggressive. For now, Lydia was the leader of our little herd. During the day, we meandered through the woodlands. Mom taught me about different trees to nibble on and the different bushes. She said the grasses were great in the winter and spring of the year, when they were in full bloom they tasted like dirt. I choose to believe her rather than test it for myself. The blueberries bushes had blossomed and born fruit. They were delightful! And so easy to pick. Even the leaves tasted good when I got some of those while grabbing the berries. I like blueberry season. Wish it lasted just a little longer. Mom told me to stand out of the way, be wary of everything and everybody, to be very careful. She said it was “that time of the year”. At first I thought she meant to be careful of apples falling from the trees and hitting you on the head. Or to be very careful as flocks of birds flew overhead, they liked to take aim and bomb anyone below them! As the unknown males joined our herd, I knew her warnings had something to do with them. The males, seemed to me, giants. Our family had previously been made up of a dozen Mom’s and their children. Now our numbers swelled as small herd after small herd joined together. Looking out over the vast field, I thought there must be five hundred of us. All gathered in one place to celebrate. I was enthralled by the feats of strength. Those muscled males rubbing their horns higher and higher on the trees. Mom said it was the “threat”. The males threatening each other with combat! Watching the pee contests baffled me. Peeing on themselves wasn't the most aromatic of scents. Mom says I will probably learn to like it by next year. I am more than a little doubtful. Suddenly over the crest of the hill, one of the males began to trumpet. He screamed so loudly I lowered my head and began to run. Mom called my name and told me not to worry, but to be ever watchful and stay out of the way. She seemed to bark at me. I hadn't heard her bark at me before. Two massively adorned males charged at one another. The crash of their two racks meeting sounded like a clap of thunder! My friend Sylvia had come to stand by my, we both shied backwards a few feet. Staring at the two males as they pawed up great tufts of sod and flung them around. They charged at one another again, their horns locked , they each tossed their heads back and forth straining at the weight of the other. The taunts and cursing of the males filled my ears. The smell of sweat lay heavy on the air. The males fought for hours. They were so evenly matched it was truly a stalemate. I smelled a new scent on the air. Turning to ask my mother what that was, I did not find her, immediately. It seemed while the two old giants fought a nearly unwinnable battle for the right to mate, a few of the younger and smaller bucks had wooed several females off to a private party. My mother, it seemed, was one of them. Love that I had to get to the end of the story to figure out why you called it Stalemate. Great play on words. That was an interesting peek into another world.